I want to thank some of the vistors to the site who have emailed me with their great comments. I did see your website and I must say that it is great both in presentation and also in subject material as I commend you for doing such an act when most do not even recognize this anniversary. Hello I have just stumbled on your site. I have lived here at corner of 70th Street and Grant Street in Omaha, Nebraska for about 11 years and have heard many stories of the tornado of 1975 from the oldtimers, that were here, who live on either side on me. I was a 13 year old at the time of the tornado and lived more north east of where the tornado ended . My children and I have a keen facination of the history and event as we now live in the area. I have an entire Omaha World Herald newspaper dated May 7, 1975 that I bought at an estate sale about 5 years ago. This site was very informative. I can see my house as it was then from the Mau's back yard. As you can imagine, I still come across glass shards and metal pieces when I am gardening. I even came across a blond wig unearthed while planting tomatoes a few years ago and I thought about that horrible time in this nieghbourhood's history. The people here are a strong group and the people on either side of me are near and dear to me (Petersons to the north and Schultes across the street to the south). As I said, we have shared many conversations over the fence. Thank you for your site. What a tribute. I was so estatic to come across your 1975 tornado website! 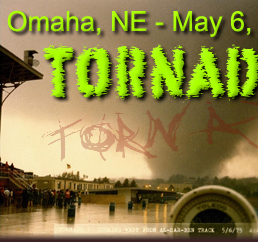 I have researched that tornado for years, as I grew up in Omaha, and I was born in 1975 (later in the year). In fact, I would easily say that I am obsessed with that very storm, as I've always tracked tornadoes, and of course I am intriqued that such a huge, powerful tornado hit my hometown. I mean, in the last 30 years, hardly a roof has been blown off in town by the weather, so a disaster like that is rare and awesome. There is actually a new restaurant out in west Omaha (near 180th and Center) that is run by a local family, and the restaurant is filled with huge, historic black and white photos of Omaha, including a 1975 tornado one. It is awesome! When I found the link to your site, on the Mau's family site, my heart jumped a beat, and I instantly knew it must be a brand new website, as I have "combed" the internet a lot in the last year, and never come across it. I actually thought about starting a 1975 tornado website myself, simply to collect personal stories that normally would be beyond my reach, and share my enthusiasm about the disaster! Now, I don't have to -- I'll just keep my eye on yours. I was so thrilled to read those stories on there. They ring so similiar to my own family's stories. 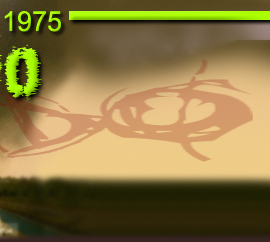 Nobody in my family tree actually saw the tornado, but they all remember being very scared that day, and realizing something was very unique in the air, as the clouds were eerily green and black. My Grandparents actually lived near 100th and Fort Streets, and they could see debris flying in the air, although a hillside blocked the view of the violent twister. I actually have a binder filled with all the details I could find on that 1975 tornado event --ALL the details big and small (and there are some suprising ones)! I own both "Omaha 1975 Tornado Books" printed immediately after the disaster, as well as the old World Herald newspapers (my grandma's gave me them to me, as they saw my enthusiasm about that tornado, even as a young child). I'm also an artist, and with my imagination, I've actually driven artistic perspectives of that tornado, and plan on doing more, as it is hard to find that many photos. So far, I have seen 5 different views of the tornado, and your website introduced me to another new photo. Thanks for that! Also, it is funny: Last summer, I put together my own ariel path of that tornado (like you). However, I used ariels from Globexplorer.com, so it turned out very similar to the aerial map your undertaking. Well, I've rambled on and on. I just share the same enthusaism you do, and I find it pretty cool that your so interested in a storm that hit Omaha, when you grew up in California. Take care and thanks again for starting your site. I'll definitely be a frequent visitor, and don't hesitate to contact me if you have any questions about that tornado. Like I said, I've done so much research, being practically obsessed with that storm, and I'm loaded with probably all (or most of) the info there is! I was 16 and lived on 68th street between Blondo & Maple. My Mom worked at Baker's on 72nd & Blondo. The weather was very strange that day and severe thunderstorm warnings were issued in the afternoon. Being an invincible 16 year old, I wanted to borrow her car to watch the Benson High baseball game. In her wisdom, she wouldn't let me. We were all home and the sirens were going off, the radio was announcing where the tornado was and where it was going. My Dad - who also thought he was untouchable - didn't think anything of the warnings. We were standing on the back porch and saw this huge black funnel cloud and the roaring of the train engines. He said, "jeepers creepers (not in that language) and we headed for the basement. I ran back upstairs to get my cat and diary. We all sat closely together in the corner of the basement until the shrieking stopped. Afterwards, we came out to the front porch and it was dark gray, raining lightly, and debris was falling from the sky. Praise God our house was not touched except for the porch swing in the backyard. The neighbors on either side lost their garages. Our neighbors two blocks away on 70th were not so fortunate. There was nothing left but foundations and basements. In the days that followed, we found $20 & $50 bills from the Ralston Bank, game pieces from Monopoly, photos, bits and pieces of peoples property strewn everywhere. Baker's was gone, my old junior high, Lewis & Clark was heavily damaged, it was a strange new world. Thank you for the opportunity to share the scariest moment in my life, up until suffering through Hurricane Wilma in West Palm Beach, Florida.